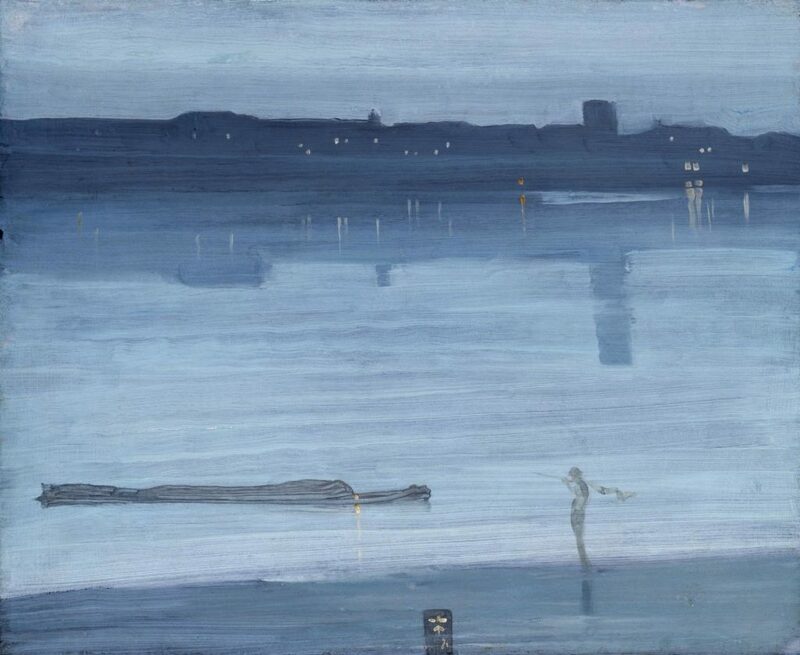 Nocturne: Blue and Silver – Chelsea 1871 James Abbott McNeill Whistler 1834-1903 Bequeathed by Miss Rachel and Miss Jean Alexander 1972 http://www.tate.org.uk/art/work/T01571. Used with permission from the Tate under a Creative Commons License. During the first phase of his career, Oscar Wilde composed a series of lyric impressions informed by what he subsequently called “the new aesthetics” (Complete Works 4: 102). Involving an erasure of the seer (“I”) so as to illuminate the seen, these curiously impersonal poems demonstrate, above all, the centrality of form within fin-de-siècle art. They also offer some insight into the politics of beauty. The impetus for examining Wilde’s verse, particularly his objective lyrics, came initially from teaching standard anthology pieces like “Symphony in Yellow” and “Impression du Matin.” In the classroom, I found James McNeill Whistler’s paintings useful for helping undergraduate students to understand Wilde’s poems while also introducing them to aesthetic debates like the one ignited by exhibition of Nocturne in Black and Gold—The Falling Rocket and Nocturne in Blue and Gold—Old Battersea Bridge. These two works, among several on display at the Grosvenor Gallery in 1877, famously provoked John Ruskin to denounce the painter as a fraud. Even Wilde, in a review for The Dublin University Magazine, mocked his sometime friend’s “colour symphonies” as “certainly worth looking at for about as long as one looks at a real rocket, that is, for somewhat less than a quarter of a minute” (Complete Works 6: 8). Wilde’s poetic impressions nonetheless owe much to Whistler’s work. Deliberately allusive, lyrics like “Impression du Matin” echo a range of intertexts, both visual and verbal, in order to put poetry above painting, art above nature, convention above invention. Skillfully arranged, they aspire to beauty over originality. Their lyric detachment notwithstanding, they function as vehicles for the poet’s subjective impressions. Their formal and conceptual complexity thus reveals the contradictory impulses toward excess and constraint that animate Wilde’s aesthetic theory. The Complete Works of Oscar Wilde. Edited by Ian Small, Oxford UP, 2000-2013. 7 vols. This entry was posted in Blog and tagged art, Oscar Wilde, poetry on March 12, 2019 by vr_wpadmin.